Gina Garcia brings her baking prowess to Kendall Yards. Beneath the shade of Parisian-inspired, black-and-white striped umbrellas, folks gather each morning. Since opening last month, the outdoor bistro tables at one of Kendall Yards' newest tenants regularly fill with customers — moms with babes in strollers, businesspeople, morning runners, retirees and college students on summer break — enjoying espresso and baked goods from Paper and Cup, the diminutive offshoot of Chaps diner and Cake bakery in Latah Valley west of town. Taking a modest space located in a front corner of the Inlander's offices, formerly the paper's lobby, Paper and Cup features the same baked goods found at Chaps and Cake, the popular, country-chic-inspired diner and bakery owned by Celeste Shaw and Gina Garcia. All of the baked goods served at Paper and Cup, along with a selection of cold sandwiches ($8; each comes with customer's choice of a cookie) in a deli case, are prepared at the restaurant and bakery located off Cheney-Spokane Road, says Garcia. Big glass jars of cookies ($2) line the top of the cold case, and displays of fresh-baked pastries ($1.75-$3.50) — scones, danishes, croissants, turnovers and more — are set out behind the counter in pie tins. Goods inside the case, including sandwiches served on slices of housemade country loaf bread, rotate daily based on what's in season, and what Garcia and her bakery team feel like whipping up. On a recent hot day, selections included chilled Key lime pie and chocolate nut pie. 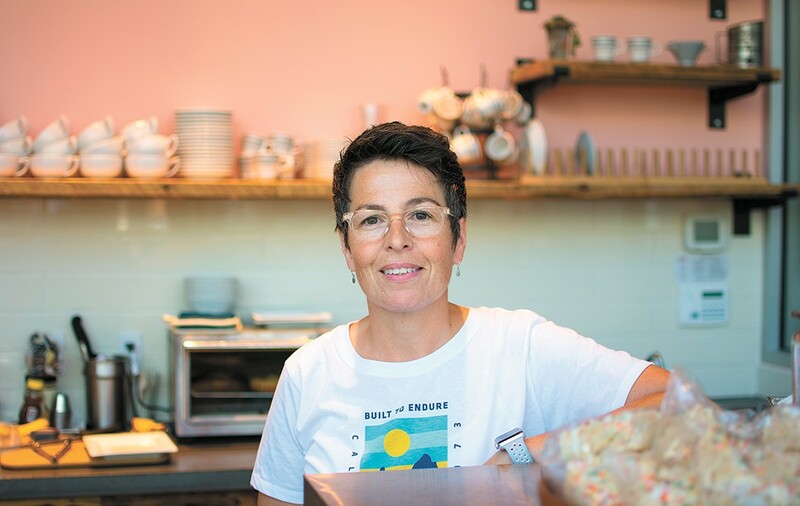 "It's been trial and error, so I'm just right now seeing what people like," Garcia notes of her decisions on what to serve at the walk-up café counter, which is too small for any food to be prepared on site. "The first day I opened I had a set menu that I was going to work out, prepping food at Chaps and assembling it here, but there's just not enough space for that," she continues. Coffee comes from Bumper Crop Coffee in Spokane Valley, the same local roaster that the Latah Valley restaurant and bakery serves, but Paper and Cup has its own signature roast. All drinks are hand-tamped and made pour-over style by the shop's two full-time baristas. Garcia is also making her own nitrogenated cold brew, served on tap, along with a carbonated housemade lemonade. While a large patio out front offers plenty of warm-weather seating, Garcia says she'll need to reconfigure come fall. As of this writing, she was still waiting on delivery of a dozen stools for seating at a narrow bar around the perimeter of two window-facing walls. Once summer's over, she'll consider adding another narrow bar top in the center of the space. While Paper and Cup is open morning to late afternoon, Tuesday through Sunday, Garcia plans to soon host late hours on Wednesdays in conjunction with the Kendall Yards Night Market, which runs from 4-8 pm. On those evenings, she's planning to serve sweet crepes, with toppings like lemon curd and fresh, local fruit. New and regular customers to Paper and Cup should also be on the lookout for a "Where's Waldo"-style social media campaign, just for fun, featuring the shop's anthropomorphic coffee cup mascot named Skip, which Garcia herself drew.